Guests of the main air gate of Ukraine can amuse yourself and your loved ones with pleasant souvenirs and original gifts. In many shops, located in the Terminal «D» of Boryspil International Airport, you can choose luxury perfumes, clothing and accessories, alcohol, chocolate, gifts and toys for younger visitors. So nice to pamper yourself shopping! However, please do not forget to keep track of time. If you are going on vacation or business trip and departure from Boryspil airport, you can purchase branded gifts and souvenirs for you and your family in duty-free shops. 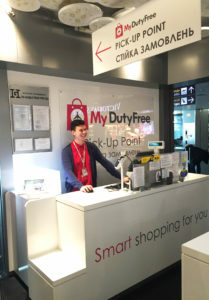 To save time and money, use MyDutyFree pre-order service (www.mydutyfree.net). It allows you to choose and order products at any time convenient to you – you only need to pay and pick up your order at the counter before the departure. In addition, for every order made with MyDutyFree you’ll get a 10% discount. As a result you will spend less time and money.